Swaffham is a Georgian Market Town and a street market is still held every Saturday morning. The Methodist Church was built in 1813 and is situated close to the heart of the town and within sight of the town’s famous Butter Cross. The church is active in the life of the local community, sharing its Christian values, renowned for its hospitality and offering a safe place of welcome and encounter for all. John Wesley, himself, visited Swaffham on two occasions which are recorded in his journal. 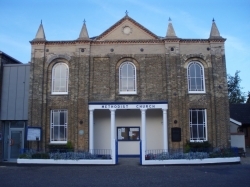 An entry from 1790 states: “A congregation was ready here, that filled the house, and seemed quite willing to take instruction.” Worship at Swaffham Methodist Church has continued unbroken for over 200 years. Address: 3 London Street, Swaffham, PE37 7DD. Volunteering Matters Tea and Chat – 3rd Wednesday in the month, hosting international students on the Volunteering Matters scheme in Norfolk. Thursday Group – 2nd and 4th Thursdays with guest speakers, tea and fellowship. Power of Prayer Group – every Friday at 9:30am. Saturday Coffee Morning – every Saturday from 9:30am till 12pm, to support good causes. In addition, there are Ploughmen’s Lunches, evenings of music, poetry and history. Please click here for more information on any of these activities. Hearing Loops in both Church and Hall. Large Print books and service sheets. Parking in Swaffham is free and there are many spaces within easy access including a row in front of the church. There is a drop-off space in front of the church and a pedestrian crossing immediately outside the church.